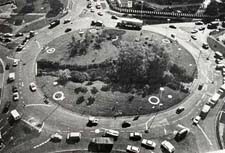 Originally one large roundabout, the Plough roundabout was redesigned to alleviate congestion problems. It was during this renovation that the Plough roundabout became the well-known, and somewhat well-loved, feature it is today. It now consists of the one large roundabout, surrounded by six mini-roundabouts (for each of the six original junctions) and actually entitles motorists to turn right at the roundabout. If finding yourself going anti-clockwise on a roundabout in Britain does not confuse you, nothing probably will. It caused so much confusion when it opened in 1973 that policemen had to be stationed at each of the mini-roundabouts to direct clueless motorists, who were no doubt shouting, crying and looking utterly confused. Described as a ‘who dares wins’ experience, the Plough roundabout pretty much renders all highway-code books obsolete. This page was added on 13/11/2010. If you are still updating this page I have some original pictures I took when the roundabout opened from the Kodak Building. At the time (1974?) I was interning at the Hemel Gazette as a Junior Photographer. 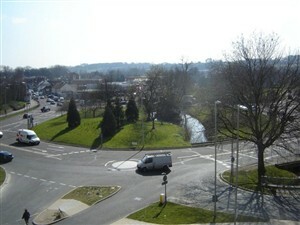 One of the pictures clearly shows a car driving on the wrong side of the road within the roundabout. It was also known for awhile as The Funny Roundabout. I have heard the mildly amusing joke; that when referring to it under this title, someone would ask, “Don’t you mean The Magic Roundabout?” The reply would be, “No. Why call it The Magic Roundabout? That is surely a children’s television programme!” The answer then would be, “Because if you get around it in one piece, it is magic!” (You know why I never made it as a comedian) Alan French.